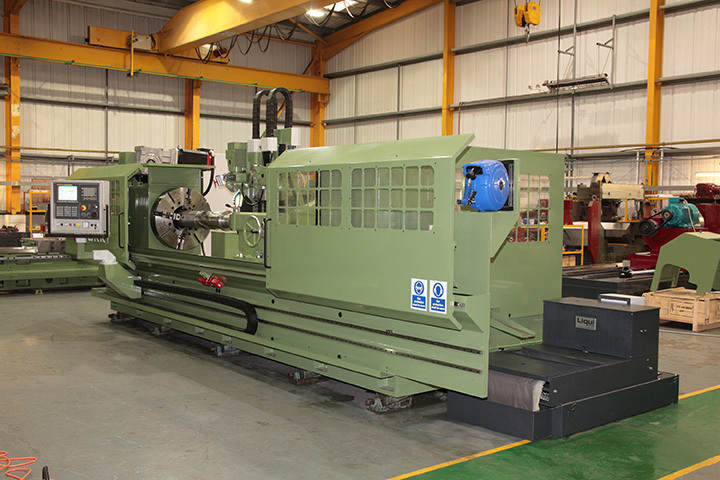 Based in Great Yarmouth, Lion Engineering Services has become one of the UK’s leading exponents in the repair and supply of ‘down hole’ drilling equipment, and over time has built an enviable reputation in the oil and gas industries. Formed in 1968 offering welding and machining facilities for the North Sea rigs, it soon made its presence felt by offering quality products at competitive prices with a quick turnaround in order to meet oil companies’ needs. Fast forward 45 years and the company now boast a multi-million pound turnover, selling its services and products worldwide, with investments in new equipment over the past few years in excess of £1M per annum. Following a recent £400K investment including a new 5 axis CNC PTA welding plant and a Mititoyo CMM, the next project was for a purpose built grinding machine. Says Managing Director Martin Brown, ‘Currently we utilise manual grinding machines and whilst we posses the in-house skills, our aim is to maintain the lead over our competition by further improving quality and accuracy, automating processes where possible.’ He added ‘As components such as fishing tools, stabilisers, drill bits and so on become more sophisticated; we need to introduce a higher level of technology to machine them’. Following extensive market research it soon became apparent that Halifax, West Yorkshire based Broadbent Stanley offered the ideal product in the form of the Yorky Oilfield Grinder. Yorky is purpose designed and built grinding machine available in semi-automatic or full CNC operation with varying bed lengths to suit customer requirements. A fourth axis is also offered on the CNC variant enabling melon profiles and double helix to be ground. Able to grind all types of oilfield tools including drill pipes up to 12 metres, the Yorky is rapidly becoming first choice for both repair shops and the OEM market. After some discussion followed by successful cutting tests, Lion Engineering Services immediately placed an order for a Yorky 4 axis machine driven by the powerful but operator friendly Fanuc Oi controller. Delivery and installation went without a hitch with the machine in production within 3 days. Along with a better quality product and machining to higher tolerances, it is believed the Yorky will reduce lead times on their products by a substantial margin. Broadbent Stanley is one of the worlds key players in the supply of machinery to the oil and gas markets with their range of high quality, heavy duty hollow spindle (oil country) lathes and gantry mills and after recognising a gap in the market for a large capacity, purpose built grinding machine, launched the range of Yorky Oilfield grinders some five years ago. From those humble beginnings orders for almost fifty machines have been won with installations world wide ranging from Aberdeen, the Americas, Europe, to the Gulf and Azerbaijan.